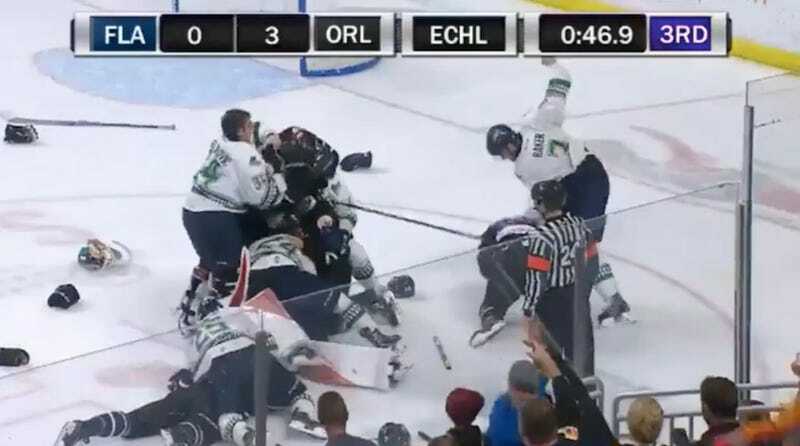 The ECHL’s Orlando Solar Bears and Florida Everblades broke out into a line brawl in the last minute of Game 4 of their divisional semifinals Saturday. The result was hectic and loud, like every facet of minor league hockey. Five Everblades and five Solar Bears received game misconducts at 19:14 of the third period. That included Orlando goalie Ryan Massa, who was fired up about the fights until he realized he was getting ejected, just 46 seconds away from a 42-save shutout. The ECHL fined and suspended Florida’s Mitchell Heard for three games, keeping him out of the rest of the series. His teammate Jake Baker received a fine and one-game suspension.